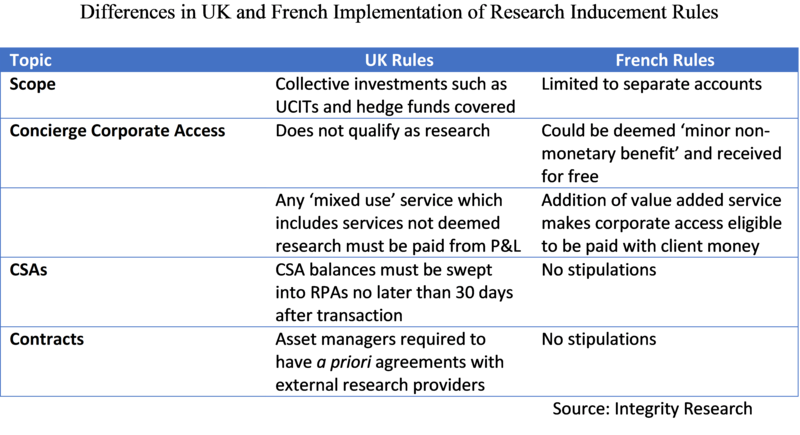 Here’s a delicious irony: Brexit will allow Europe to throw off the yoke of burdensome UK regulation – in this case research unbundling rules imposed by UK regulators while MiFID II was being drafted. French securities regulators, supported by a broad spectrum of French market professionals, launched a well-coordinated attack on research unbundling to stimulate reform after Brexit. The French securities regulator L’Autorité des Marchés Financiers (AMF) has been a longstanding critic of research unbundling, publicly opposing the successful efforts of British regulators to insert hard-line measures into MiFID II. French opposition dates back to 2014, even before Brexit became an issue. Since Brexit, French opposition has become institutionalized, as the French seek to entice UK financial institutions to defect to Paris. In a recent interview with the Financial Times, AMF President Robert Ophèle promised to campaign for deregulating MiFID II’s research unbundling provisions. “Even without Brexit we would have had to look at [MiFID II] again because there are very detrimental effects on research, especially for mid-caps, that’s absolutely clear,” he told the FT. He said Europe was engaged in a “dangerous game” as research capacity was being pared back for many smaller companies. To monitor the effects of MiFID II’s research unbundling, the AMF along with the French Treasury (Direction Générale du Trésor) endorsed a new initiative, MIFIDvision, in February 2018. All major French financial trade associations are participating in the initiative. 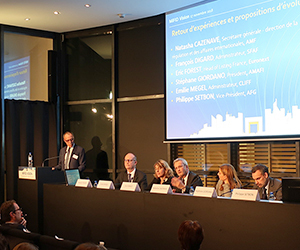 At the end of November 2018, MIFIDvision members released their first set of recommendations for regulatory reforms, the result of a well-attended symposium. The conference was initiated by French Society of Financial Analysts (SFAF) and included the French Asset Management Association (AFG), the French institutional investor association Af2i, the French sell-side trade association AMAFI, the French investor relations trade group Cliff, Euronext, Paris Europlace and French business confederation MEDEF, in addition to French regulators including AMF President Robert Ophèle. Analytic coverage of French stocks has declined, particularly for those with a market capitalization between EUR 150 million and EUR 1 billion, where the average number of analysts per stocks decreased from 5 to 3 over the past 3 years. 40% of small and medium caps are not covered or covered by only a single analyst. Issuers, even including large-cap firms, complained that corporate access engagement with investors has become restricted. Concerns were raised about increased costs for listing new issuers, impairing the access of small and medium enterprises to the financial markets, a concern first raised by the AMF in 2014 when opposing British proposals to unbundle research. Participants also noted that fixed income and macro research is being harmed by MiFID II, which is creating asymmetry in information access without decreasing spreads as originally envisioned. Despite these impacts, attendees reported that French research budgets declined only slightly at this stage and spending on independent research had remained fairly stable – in contrast to the UK where boutiques have been negatively affected by research budget cuts. MIFIDvision participants proposed an initial series of reforms to MiFID II’s research unbundling provisions, with promises to continue to monitor the cost/benefits of the new regulation. The conference proposed extending trial periods for new research providers from 3 months to 6 months because of the difficulty in evaluating analyst quality over a shorter time frame. Fixed income currency commodities (FICC) research should be removed from the scope of MiFID II. In addition, MIFIDvision suggested the unbundling rules should be eased for smaller asset managers, research pricing should be simplified and consideration should be given to mechanisms to foster buy-side sponsored research (as opposed to issuer sponsored research). Some observers in the UK fear that UK asset managers conforming to the gold-plated unbundling demands of UK regulators will become exposed after the UK exits the EU. The concern among UK industry observers is that EU regulators will relax unbundling rules in MiFID III, isolating the UK asset management industry in order to encourage more industry defections to the Continent. Such an outcome would also lessen pressure on US regulators to accommodate MiFID II unbundling requirements. In its criticism of research unbundling, the AMF has received implicit support from other Continental regulators, including German regulators. The rules ultimately adopted by the AMF were less stringent than those imposed by UK regulators and served as the template for other Continental regulators. MIFIDvision’s agenda is not solely altruistic. In addition to monitoring unbundling, the group was formed to “assess the competitiveness of the Paris financial center” and “conduct comparisons with other European and International financial centers.” In this sense, the initiative is part of a larger charm campaign to woo more financial institutions from London to Paris post-Brexit. The AMF’s outspoken criticism of unbundling is in marked contrast to the UK Financial Conduct Authority’s pledge to scrutinize the industry’s implementation of unbundling as part of a multi-firm supervisory review during its current fiscal year (2018-2019). We’ve been skeptical of how vigorously Continental regulators will enforce unbundling and it is hard to see French regulators cracking down on rules they believe are detrimental. Meanwhile hard-line Brexiteers such as the UK Institute of Economic Affairs have called on the FCA to scrap MiFID II once Britain leaves the EU, which the agency has said it will not do. The joke is that if the French have their way, the EU will deregulate the FCA’s rules, not the other way around. The increasing political isolation of its policies can’t have failed to escape the FCA’s notice, especially since FCA Chief Andrew Bailey has been campaigning to be appointed governor of the Bank of England. The obdurate reluctance by US regulators to consider unbundling reforms increases the isolation further. Will Bailey continue to try to create a new Albion, a green and pleasant land for asset owners, or will he back down in face of Brexit tribulations? MiFID II Increases Risk of Research Underspending – Performance Implications?